Review: Stone Roses, War and Peace (Simon Spence) | What Hi-Fi? Like something from Awakenings, the Stone Roses bandwagon has once again rumbled into life. This time, however, with good cause: the potential reunion of the ‘classic’ 1989 line up, burying of hatchets all round and even a third (fourth if you’re pedantic) album in the pipeline. Time to dust off the Reni hat then. To date there have been two readable ’Roses biographies. Punk veteran John Robb’s 2001 The Stone Roses and the Resurrection of British Pop was a good tome at the time, and head and shoulders above anything else that had gone before – which, to be fair – wasn’t much. Mick Middles’ engaging Breaking Into Heaven appeared in 2006 and, well, that was it. Finally, however, with the completion of Simon Spence’s War and Peace there now exists what can be described as the definitive book on the band. It can’t have been an easy book to write. The Stone Roses camp is notoriously insular and, like all the best biographies, the bulk of the principle characters are missing. In his footnotes, however, Spence mentions that Reni took a strong interest throughout and that band participation was only scotched because of the forthcoming reunion. Understand, too, that this isn’t a reunion cash-in. War and Peace has been a long time in gestation and while there is a footnote on forthcoming events, it’s clearly tacked on to the main work. For the first time, the band’s early years are covered in detail thanks to active participation by pre-Mani bassist Pete Garner and second guitarist Andy Couzens together with other pivotal characters. The rise of the ’Roses becomes a spell-binding read; from the Hannett sessions, through the blue-eyed pop of Sally Cinnamon and Elephant Stone to the glorious Stone Roses album. One of the most compelling interviewees from this period (and beyond) is legendary producer John Leckie, whose insights into the recording process are simply fascinating. And yet, there’s that sense of unravelling; like reading about the Titanic, you know there’s going to be no happy ending. So onwards we go, wincing at the catastrophic Zomba recording contract, how the band never received (or knew of the existence of) its £40,000 Christmas bonus, instead getting £500 each from then manager Gareth Evans. Good money followed bad and the wilderness years, Geffen years and slow decomposition of the band shuffled turgidly on, until the bitter and childish, long-running Squire/Brown war of words was all that remained. Mercifully there’s no vilification of characters in the pages. Squire’s descent into cocaine overload is treated sensitively, while personality clashes and squabbles are handled with diplomacy rather then finger-pointing. The one exception is Evans, who starts as a potential saviour and ends up looking less than savoury. Peculiar facts abound in this work – such as the booking of the band on Football Focus in 1994 to play five-a-side against Manchester United (it was squashed by Squire who thought he would look daft) and a lovingly in-depth account of the 1990s paint-splattering incident against Paul Birch, managing director of FM Revolver records. There’s also a lovingly in-depth account of the court case that followed. Then there’s details about the one-off gigs, the silent interview technique, how Factory supremo Tony Wilson hated them… it’s all there, and in a lavish package that features mainly unseen pictures – including two striking ones for the front and back covers. There are a couple of minor errors – it would be a miracle if there weren’t – but as a rule they don’t detract from the narrative. For the casual listener, or die-hard fanatic, this is a genuine masterpiece. 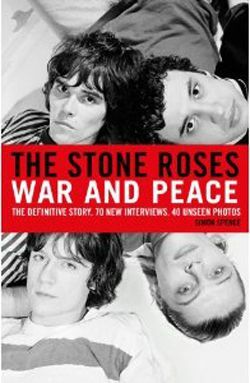 Difficult to put down, easy to follow and well written, it should be on any self-respecting Stone Roses fan’s bookshelf.